Being able to watch your rabbits — and any other pet, really — when you are not home can be very comforting (and entertaining) when you are off at work or on vacation. It can give you a great peace of mind when you can see your rabbit visually hopping around on your phone or computer screen and not loafing in pain in a corner. 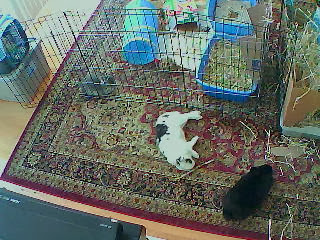 Personally, I had never thought of monitoring my rabbits remotely until the instance a couple years ago when the fire alarm went off in the apartment, and the bunnies freaked out in their x-pen and almost bashed their brains out.